GAW Miners have recently announced some really interesting big plans about the evolution of their mining platform, but here we want to focus on something that is already available – their new prices of the various Hashlet Digital miners. 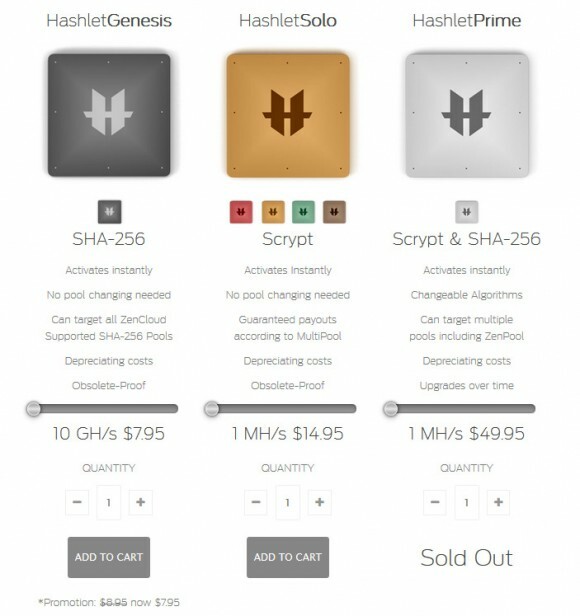 The Hashlet Prime is no longer available for sale directly from GAW, however you can still get your hands on some Primes through the Hash Market at the ZenCloud service at $36.64 USD per MHS as the lowest price at the moment. Now, paying so much for 1 MHS worth of Scrypt mining hashrate does not seem very reasonable at the moment, however with the Haslet Primes you get some interesting options to engage you allow you to mine more than 1 MHS normal hashrate can generate for you per day. The other Scrypt mining Hashlets that pay out in BTC as well as the Hashlet Genesis that mines directly for Bitcoin have new prices and we are going to take a look at how much they cost and what profitability you can expect to get should you decide to invest in them. As you can see from the chart above with the current low BTC and LTC prices, the maintenance fees do take away quite a lot of the coins you should have mined resulting in a low actual profit. Using the latest data for the mined coins by the different Hashlets for the previous day we can see that the Hashlet Genesis and the Multi Hashlet seems to be the most profitable Hashlets at the moment. It seems the Waffle Hashlet actually caused a loss for the miner for the last day based on the performance results it shows. Of course the daily earning numbers do vary and the results can be different each day, and the Hash Market where users sell their Hashlets can also provide some interesting deals in terms of lower price than the official ones. The Hashlet Genesis (10 GHS Bitcoin cloud mining hashrate) is now priced at $7.95 USD and the Hashlet Prime is no longer available for sale. Among the newly introduced features are things like SHA-256 mode for Hashlet Primes that would allow you to mine at BTC pools with the Hashlet Prime with 40 GHS per 1 MHS rate, HashPoints bonus points are now worth 1 cent each, Genesis Hashlets are also now supported on the Marketplace where you can trade them. This is all a part of the move from the current ZenCloud platform to the new upcoming HashBase platform that is supposed to offer new interesting features for the miners when it gets released later this month. On a side note, if you were one of the first to purchase hashrate in the form of a Hashlet when they were first introduced about 2 months ago, then you might’ve already reached a full ROI. In our case, we’ve stared testing the Hashlet just after it was announced and a bit short of two months we have earned back what we have invested. This however was possible if you were among the first to purchase a Hashlet at a price of $15.99 USD per MHS before the introduction of the Hashlet Prime. For users that have purchased Hashlets later on it will most likely take some more time for them to get a return of their investment. It has been a month already since the introduction of the GAW Miners Hashlet and for the time that has passed a lot has happened. If you were among the first to purchase Hashlets you might have already got half of your investment back, today we have reached $40 USD mined from our initial $80 USD investment in 5 MHS to try out the Hashlet when it was introduced. The new higher prices and different Hashlet miners will probably need some more time to ROI, but with the new features being added the difference may not be much. And talking about new features, today some new interesting additions were made to the Hashlets, the ability to sell your Hashlet at 80% of the Retail price should you decide that you no longer want to have it – this is available for all Hashlets. When you put your Hashlet on sale it will continue to mine for you until it gets sold to someone else that is currently buying this type of Hashlet (in first 24 hours we could not sell a Hashlet that we wanted to test the new feature with). The other new interesting feature is available only for the Hashlet Prime – an option to boost your hashrate twice a day with 50% (by clicking the small rocket next to the hashrate) for 30 minutes each time (once every 12 hours).